In celebration of the 100th Anniversary of the birth of one of France's most versatile directors: René Clément, Studiocanal have announced that they will be releasing the following Clément titles in January: Forbidden Games, Gervaise, The Deadly Trap and And Hope to Die, all UK DVD premieres. Forbidden Games is currently screening at the French Film Festival and will also be released on Blu-ray. The RRP of each disc will be £15.99 for the DVD and £19.99 for the Blu-ray. Described by critic Rex Reed as the French Hitchcock, René Clément was one of France’s great post-World War II era directors. Studying as an architect originally, it was at the Ecole-des-Beaux-Arts that he developed an interest in filmmaking. In 1936 he directed his first film – a short written by and starring Jacques Tati. Clément then spent most of the latter part of the 1930s making documentaries. After the war he directed his first feature: La Bataille du rail (1945), about the French resistance, which was a critical and commercial success. He twice won Oscars for Best Foreign Language Film – including Forbidden Games, along with many other awards throughout his career. 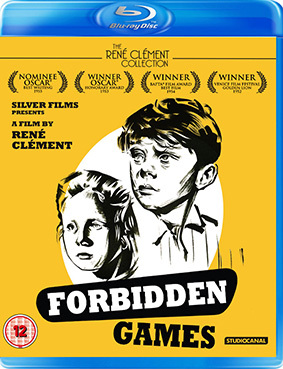 A timeless evocation of childhood innocence corrupted, René Clément’s Forbidden Games tells the story of a young girl orphaned by war and the farm boy she joins in a fantastical world of macabre play. At once mythical and heartbreakingly real, this unique film features astonishing performances by its child stars and was honoured with a special foreign language film Academy Award in 1952. The film also won Best Film (in any language) at the BAFTAs and The Golden Lion in Venice, and stars Brigitte Fossey, Georges Poujouly, Lucien Hubert, Laurence Badie, Jacques Marin, Suzanne Courtal, Denise Péronne, André Wasley, and Amédée. The gripping Gervaise is René Clément’s vivid adaptation of Émile Zola’s 1877 masterpiece L’assommoir, an uncompromising depiction of a laundress’s struggles with an alcoholic husband while running her own business. Gervaise was the winner of the BAFTA for Best Film and Best Foreign Actor, two prizes at Venice including Best Actress, and was also nominated for the Oscar for Best Foreign Language Film. The films stars Maria Schell, François Périer, Suzy Delair, Armand Mestral, Jany Holt, Mathilde Casadesus, Jacques Harden, Ariane Lancell, Jacques Hilling. There will be no extras on this one. The Deadly Trap is a taut mystery thriller starring Oscar-winning actress Faye Dunaway (Network, Chinatown, The Thomas Crown Affair) and Oscar Nominee Frank Langhella (Frost/Nixon). Jill, a young American, is married to Philip. They come to live in Paris with their two children, but seem to be going through a crisis. Jill, who lives only for her children, suffers frequent memory losses. Suddenly, the children disappear and Jill is drawn into a dark mystery... The cast also features Maurice Ronet, Barbara Parkins, Raymond Gérôme, Patrick Dewaere and Raymond Burr. Again, no extras on this disc. Based on the David Goodis novel Black Friday, And Hope to Die is a melancholy crime caper starring veteran actors Jean-Louis Trintignant and Robert Ryan. One summer night, a group of children are playing in a street of Marseille. Their game consists of attacking an American skyscraper in order to steal a priceless object. In the meantime in the United States, a young man who is being pursued, takes refuge in a house where a group of strangers are getting ready for real to attack a skyscraper in order to steal something which is priceless to adults... Which of these two groups is leading the action? Where does reality end and dreams begin?